We are “DeenBros.” I think.....if y’all care to hunt it down and have problems finding us, drop a line here and Lisa or Phil can help you out. Why in God's name would anyone want to know what the Deen Bros. are doing or "thinking" ? 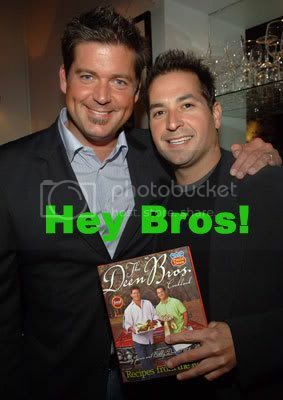 A friend once called the Deen boys the "Romulus and Remus of the Food Network". Truer words were never spoken. I always thought of them as Akbar and Jeff. Maybe brothers, maybe lovers, possibly both.